"With Ole at the wheel and the crowd behind them, the Red Devils should go all out from the start in the first leg just as they did against Inter in 1999, Roma in 2007 and Barca in ‘08 (the last time the Catalans came to Old Trafford." There have been 11 matches between Manchester United and Barcelona, the first in 1984 and the most recent the Champions League Final of 2011. Barca won both those matches but, overall, there have been four wins apiece and three draws. As a United fan, my memories of playing Barca are mixed. I still don't understand how Mark Hughes managed to score from such an acute angle in the Cup Winners' Cup final victory of 1991 in Rotterdam. Seventeen years later, the goal Paul Scholes smashed past Victor Valdes at Old Trafford was similarly awe-inspiring. There were two entertaining 3-3 draws between the sides in this competition in 1998 (over 5.5 goals on Wednesday anyone? ), but of course there are matches against the Catalans that still induce shivers among United fans. 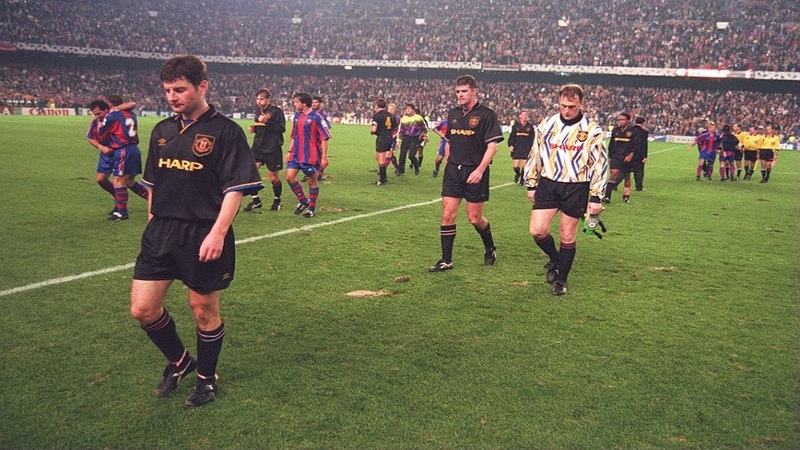 Many would cite the Champions League final defeats of 2009 and '11 as the nadirs, but for me the 4-0 humbling against Hristo Stoichkov, Romario et al at Camp Nou in 1994 was the truly harrowing one (see how dejected Denis Irwin, Gary Walsh and Gary Pallister look in the pic below?). After Paris anything is possible. True, United have since lost to Arsenal and Wolves (twice), but they can compartmentalise competitions and conjure the spirit of their magnificent victory in the City of Light. With Ole at the wheel and the crowd behind them, the Red Devils should go all out from the start in the first leg just as they did against Inter in 1999, Roma in 2007 and Barca in '08 (the last time the Catalans came to Old Trafford). This past decade, great European nights have been thin on the ground in M16, so Old Trafford is due one. Everyone wants to play their Champions League second legs at home but, after Paris, United have invaluable experience of getting a result against the odds in an illustrious opponent's stadium. Unless the first leg goes horrifically wrong for them (and that is a possibility against this Barca attack), the Reds will go into the second leg believing they can progress. And of course, Solskjaer is forever synonymous with Camp Nou. Next month, it will be 20 years since the Norwegian hooked home United's winner there in the 1999 Champions League final. Steering his young team past the best side in Europe over two legs would rank alongside that achievement. It has to happen. It just has to. 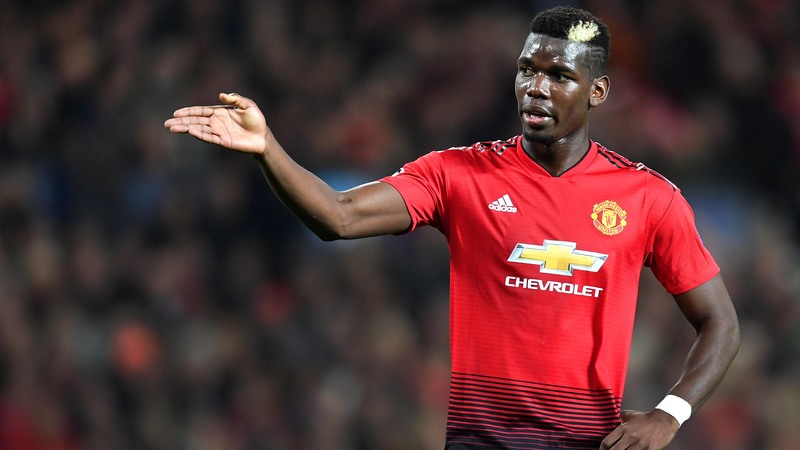 After Paul Pogba starred in France's World Cup-winning team last summer, Jose Mourinho suggested the midfielder was only capable of performing in big games. Of course, Mourinho was wrong, but big games do often get the best out of Pogba (last season's Manchester derby at the Etihad, for example). Having missed Paris through suspension, the Frenchman will be determined to be United's driving force in this quarter-final. Meanwhile, United's other best player, David De Gea, had a poor World Cup for Spain and will determined to prove a point here. In both legs, we will need him to be at the top of his game. Barca come into this tie following a comfortable 2-0 win over Atletico Madrid. In that sense, they're in excellent form. However, United didn't play at the weekend so they should be the fresher team. On top of this, Barca's 4-4 with Villareal showed the Catalans have defensive frailties. United's attacking trio of Marcus Rashford, Jess Lingard and Anthony Martial have the beating of the ageing Gerard Pique and inexperienced Clement Lenglet. Romelu Lukaku - who was arguably United's true hero in Paris - offers something different but just as potent from the bench. They can and do still blow teams away but Ernesto Valverde's Barca aren't as fearsome as the one that destroyed United in two Champions League finals under Pep Guardiola a decade ago. One thing that's gone under the radar during the Solskjaer reign is how well United have defended since he took charge. Victor Lindelof is emerging as United's most commanding centre-back since Nemanja Vidic while left-back Luke Shaw is increasingly important. Lyon nullified Lionel Messi and Luis Suarez in the first leg of the previous round while Inter and Spurs both contained Barca's attack earlier in the competition. 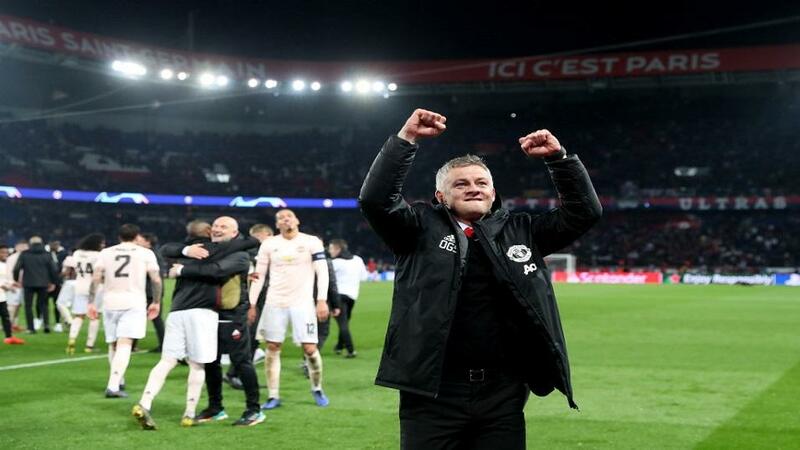 The way United defended in Paris, and Solskjaer outwitted his opposite number with his tactical manoeuvrings , is proof that they can withstand an explosive attack.